This has been for years touted as the definitive Prokofieff Second by a good many musicologists and record collectors. Recorded on December 20, 1937, three days after Heifetz and Koussevitsky gave the work its American première, it is riveting from first note to last. Naxos spares no expense here, using transfers by the esteemed Mark Obert-Thorn and intelligent notes by Tully Potter, not to mention a rare cover photo of Heifetz (from Potter's collection). In short, this production in every way is first-class. To Prokofieffians and fiddle enthusiasts alike who lack this rendition of the G minor Concerto, this is a must. Few violinists could play with the intensity and polish of Heifetz, and while there have been many fine recordings of this Concerto, none, including those of Milstein, Stern, Ricci, Chung, Milanova, and many others, have managed to unseat this one. Even Heifetz's own later recording with Munch for RCA, from about 1960, fell a rung or two short of this first effort. Younger violinists like Bell and Papavrami have turned in fine efforts, too, but don't offer quite the sheer dynamism heard in this Heifetz rendition. The only drawback here, of course, is that the sound, decent as Obert-Thorn has made it, is rather dated, reason enough for some audiophiles to opt for a more recent version. Others may also find Heifetz's 23:53 timing a bit rushed, as typical performances of this Concerto clock in around twenty-six or twenty-seven minutes. In the end, though, this is, if not the last word on the Prokofieff Second, then certainly one of the greatest readings it has ever received. Koussevitsky and the Boston players turn in splendid work, for their part. 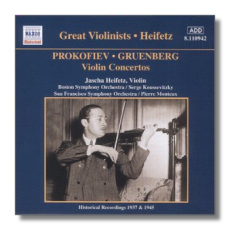 The Gruenberg Concerto makes a fine bonus – Heifetz didn't play the Prokofieff First (that was Szigeti's piece in his eyes) – and this obscure work, commissioned by Heifetz during the war, is tuneful and quite approachable, though some may find it overlong at thirty-eight minutes. Heifetz and company play it with total commitment. In the end, this must be counted as an important reissue, both for the performances and the high production values. Highly recommended.